Epigenetics and Dermatology explores the role of epigenetics in the pathogenesis of autoimmune-related skin diseases and skin cancer. 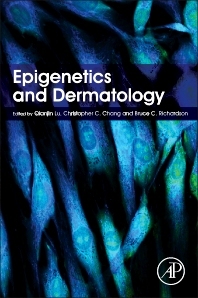 Leading contributors cover common and uncommon skin conditions in which extensive epigenetic research has been done. They explain how environmental exposures (chemicals, drugs, sunlight, diet, stress, smoking, infection, etc.) in all stages of life (from a fetus in-utero to an elderly person) may result in epigenetic changes that lead to development of some skin diseases in life. They also discuss the possibilities of new and emergent epigenetic treatments which are gradually being adopted in management of various skin diseases. Chapters follow a conventional structure, covering fundamental biology of the disease condition, etiology and pathogenesis, diagnosis, commonly available treatments, and epigenetic therapy where applicable. Basic biologists working on skin-related diseases, and translational researchers interested in further exploration of epigenetic therapies. Some oncologists. 12.5 What Might Trigger Epigenetic Dysregulation in SSc?